OVERVIEW: If there was a 'pounds per point' league table based on player wages, St. Johnstone would be top. And not for the first time in recent years. It isn't always flamboyant - though it must be said they scored a lot more goals this season, as well as conceding more too - but no Premiership side was better at grinding results out than the Perth Saints. When you factor in the mid-season sale of star player Michael O'Halloran, their achievements look even more impressive. Aside from a decent Scottish Cup run, I don't think much more could have been asked of them. 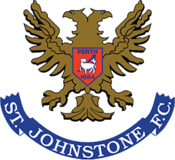 HIGH POINTS: While other teams were thinking of their holidays, St. Johnstone saved their best performances for after the split. Victories at home to Aberdeen and Celtic were impressive and well deserved. Their 5-1 win at Pittodrie in October might have been the most stunning of all, though. LOW POINTS: They missed a great opportunity to reach the League Cup final, choosing the semi against Hibs for an uncharacteristic off-day. And crashing out of the Europa League so early was a huge disappointment. STAR MAN: O'Halloran aside, this could be a toss-up between David Wotherspoon, who had the best season of his career, and veteran striker Steven McLean, who at 33 could possibly say the same. ONE FOR THE FUTURE: Young midfielder Craig Thomson certainly showed flashes until he broke his collarbone in the spring; he could break into the team regularly next year. WASTE OF SPACE: Giving John Sutton a 2 year deal last summer looks pretty daft now. His only goal for the club was on the opening day, and he hasn't even made the bench in recent weeks. He was officially transfer listed this week, but has been available since Christmas. THE BOSS: It's no surprise that Tommy Wright has been linked with Nottingham Forest. His record at McDiarmid Park is outstanding, and it is only a matter of time till he moves on to better things. It's hard to see how his stock could climb higher in his current post, especially when at least one more club with far greater resources will be joining the Premiership next season. He's an excellent manager who is able to motivate players and whose tactical acumen is very underrated - he might have been the only boss to completely outmanoeuvre Mark Warburton's Rangers this season. PROSPECTS FOR NEXT SEASON: Every year I worry that it'll be one too many for the older players, but the likes of McLean, Chris Millar and Dave Mackay haven't slowed down yet. Holding onto Wright is the highest priority; making sure there is a reliable goalscorer to take the heat off McLean is the next one. Otherwise, this is a settled squad which should be just as competitive in 2016/17. Surely sooner or later they will fall out of the top half of the table, but would you dare to bet on it being next season?